Are you looking for an experienced electrical testing company to complete your infrared thermographic scanning requirements? Kerfoot electrics provide a comprehensive, nondestructivetesting service to all clients who require inspection of their equipment and machinery. Monitor any thermal changes to your parts, materials, and systems with our thermographic survey. Our team are competent and careful – ensuring the utmost respect for your property. Infrared thermographic scanning is a non-invasive means of testing devices, systems, and objects for thermal readings. These readings can indicate the electrical conductivity of the test subject, and inform the technicians of any potential risk to your business. Mysterious equipment failure and electrical system issues can be detected with a Kerfoot thermographic survey. Thermal imaging services are an essential preventative measure in any business. Regular scanning and equipment maintenance can help our clients avoid equipment and system failure, loss of productivity, and physical threats – including fire. 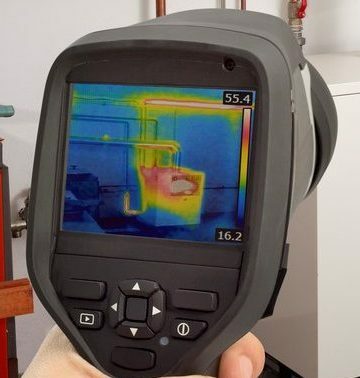 Thermographic inspection services, combined with documentation of test and results, will allow your business to continue on an uninterrupted course of productivity. Our thermal imaging services are conducted by a team of technicians with over 40 years of experience in the industry. Each thermographic survey is completed by a member of staff who will strictly adhere to the current Australian safety standard. Our tests are fully compliant with workplace safety laws, and are accompanied by supporting documentation. Our customer service team communicates clearly with clients through our advanced enterprise management system – which allows instantaneous communication between clients, technicians and support staff. As a Kerfoot client, you will have access to a range of ongoing support options including notification of scheduled maintenance, and answers to any of your enquiries. If a thermal hazard is detected during an infrared thermographic scanning session, our Kerfoot team can guide you through possible solutions to your problem. We conduct maintenance, repairs, and equipment installation on a regular basis, and will work quickly to ensure your business maintains its productive momentum. Our project management team can customise a solution that fits with your priorities and ensures only the most effective electrical procedures are utilised. Why Choose a Kerfoot Electrician? If you have any questions about the benefits of regular electrical testing and maintenance, or any of our services, get in touch with our personable customer service team. We want our clients to be informed and ready to invest in hazard prevention & detection services. You can be sure that your enquiry is in competent hands with a team of professionals who are dedicated to servicing businesses. Contact us on 1300 850 869 or fill in the Contact Us Form to enquire about and infrared thermographic survey today.